Hajo Broersma, Stefan Dantchev, Matthew Johnson and Stefan Szeider, eds. 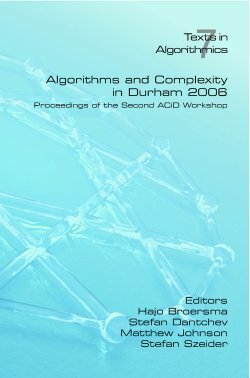 This volume contains the proceedings of ACiD 2006, the second workshop on Algorithms and Complexity in Durham that was held from 18 September to 20 September, 2006. The volume contains abstracts and extended abstracts of the talks presented at the workshop, including the one hour lectures presented by the four invited speakers: Jan Krajícek (Academy of Sciences of the Czech Republic, Prague), Alexander Schrijver (CWI, Amsterdam), Detlef Seese (AIFB, University of Karlsruhe), and Berthold Vöcking (RWTH, Aachen).